Africa Slums is a VR demo for Drummer Agency, a UK charity consultancy. Customer required an immersive solution that would boost donor acquisition. The VR application allows end users to experience life in a deprived community. They can interact with the environment, contribute to the cause, and see how these virtual donations make the difference. 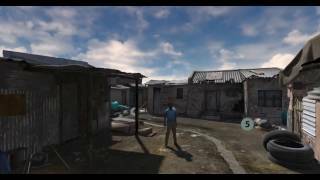 Africa Slums project was released on Samsung Gear VR, but it is easily portable to other headsets. The Drummer Agency required an immersive demo that would allow potential donors to experience life in a deprived community. The demo was expected to boost donor acquisition by showing how exactly donations can improve life of the African people. Africa Slums application had to be easily accessible by wide audiences and not fixed to a particular office. Our client wanted to show the demo to potential donors at their convenient locations. We decided port Africa Slums to Samsung Gear VR. This headset is an ideal solution for mobile VR thanks to its cheap price, mobility, and compatibility with various Android smartphones. Second requirement was to make photo-real characters that evoke empathy. N-iX Interactive chose Unreal Engine, famous for its superior graphics quality. Polished lighting and particle effects like flying sand and dust made virtual slum look authentic. Realistic characters, accurate animations, and a convincing three-dimensional environment made up a truly captivating demo. The client was fully satisfied with the project delivery. Africa Slums demo gave our customer a new immersive technique to accelerate donor acquisition. The finalized application includes two modes: interactive demo and VR video. The first one allows users to interact with the environment and see how simulated donations improve deprived communities. The second one is practically the same demo, but in a spectator mode.